Traffic is very essential for any blog.If you don’ have traffic,it would be really very difficult for you to earn money from it.Pinging is the way to inform search engines that you have updated your blog/website.It is infact a nice tool.So many pinging tools are there on internet but you should not use any of them because sometime,it harms you more than helping you. Recommended Article–How to get backlink from high PR sites? What is the Meaning of Pinging? Pinging is just a process to notify the search engines that you have added new information in your blog/website or changed the configuration of your Blog/website.After that,search engines will crawl and index your site.Most of the technocrat also believe that it is a method of get high ranking on Search engines which means it can be really helpful in getting high rank of SERP(Search Engine Result Page). When to Ping and When Not? Pinging is helpful when used wisely.However it can also do the damage,if you are used it frequently.You should use Ping service after writing any Post or changing some content of your blog/website.I will recommend you to use it just once in a day.If you will use it frequently then search engine will consider it spamming and will ban your blog/website. Is it safe to use any kind of Ping Websites? Obviously Not.You should not use the ping service of any website.Before using it,do a proper study on that particular website because it is really very important.If you will ping your website/blog on any spamming website then it will do much harm than good.So use your brain.In this post,i will provide your the list of Best Ping Websites. What information are needed for using the Ping Services? 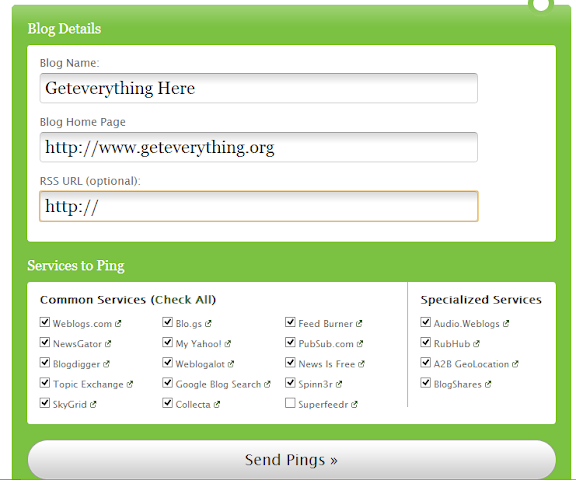 Is there any Benefit of using Ping Services? Definitely..It is quite helpful in bringing traffic to your Blog because it strengthen your position in SERP(Search Engine Result Pages).Pinging your blog/website indirectly means that you are informing search engines that you have updates your blog/website and they should crawl and index it.It also improves your alexa rank as well. So many blog owners claims that after using Best Ping Websites,they achieved better Traffic and ranking on Alexa.In this post which is titled as “Increase traffic on your blog by using Best Ping Websites”,i tried to provide complete information.However if you still feel that i have missed something or something is confusing then feel free to discuss with me through comments. You Might Also Like–How Pinterest can help you to get Quality Backlinks?